Make no mistake, the Bitcoin Loophole is a relatively new scam entered into the Cryptocurrency market by highly trained con artists! In some cases, Crypto based trading software have already been established as legitimate and profitable however, this is definitely not one of them. Our assessment shows there is more than enough evidence to debunk anything you may see or hear on BitcoinLoophole.com. 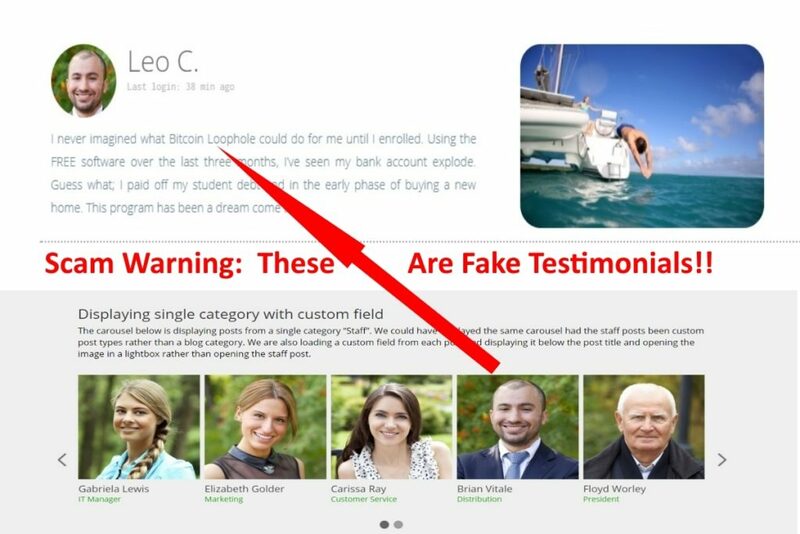 From unregulated brokers to stock images and faked reviews, it is crucial for all traders to read this Bitcoin Loophole review in order to avoid becoming the next victim of this unscrupulous scam production. Bitcoin Loophole by the alleged Steve Mckay promises unsuspecting visitors a guaranteed sum of $13,000 in just 24 hours. They advertise the software as an automated solution for trading Cryptocurrencies which is still in it’s Beta Testing stage. The newly created app supposedly takes advantage of huge returns offered by minimal Bitcoin investments. Although the entire production comes across as a lucrative opportunity, allowing investors to lead a life of luxury after just a few days of trading with the dubious Crypto software, this Bitcoin Loophole review will expose the indisputable truth that will deter you from the guaranteed financial lost. All traders need to be aware that should you mistakenly become involved with this fly-by-night program, you will also be exposing yourself to unregulated brokers. We began our assessment of Bitcoin Loophole by entering a fake email address on their home page with the intention of seeing which broker we would be assigned. We were immediately directed to Broker Official. This particular broker, located in Dominica, is not regulated and has acquired an exceedingly awful reputation since its inception in 2015. Additionally, some of our subscribers alerted us to the fact that Bitcoin Loophole makes use of unethical marketing, such as aggressive email spamming. Should you receive any such emails, do not click on any of their links. Rather unsubscribe immediately and then delete. A rather common ploy used in get rich quick schemes is the use of fake reviews. This tactic is present on the BitcoinLoophole.com site. For instance, we see a testimonial by a man named Leo C. His review of the product states that after using the free software for a period of three months, he has managed to pay off his student loan and is currently in the early stages of buying a new house. We checked Google for any information related to his picture and discovered the man is actually not associated with the software by any means. This is clearly a stock photo, as we found the same image on another site. On that site, the image is used as a means of displaying how a particular website plugin works. This serves to confirm that he is actually not a member of Bitcoin Loophole scam, only a fraud would use fake marketing tactics. From the outset of our investigation, it was apparent that Bitcoin Loophole software is linked to another scam we previously exposed called the Bitcoin Code. These two fraudulent systems are almost carbon copies of each other. All one has to do is view each app side by side to notice the uncanny similarities. For example, Steve Mckay is presented as being the creator of the Bitcoin Loophole scam. However, when you visit Bitcoin Code website, you will find the same name displayed as the genius behind that system too. While we would love to consider this as mere coincidence, we know from experience that many scammers aim to target as many victims as possible, by releasing the same software under different names and a few slight changes. The name of this software alone should deter any trader. To date, there is no known loophole in Bitcoin. When Satoshi Nakamoto posted the whitepaper on Bitcoin, he/she also uploaded the source code for the first implementation. The code and protocols have been public ever since Bitcoin’s inception and have been reviewed by many different people hundreds of times. That is the advantage of open source software. Bitcoin has been going strong since 2009, so if there were any ‘backdoor’ vulnerabilities, it would have been discovered by now and fixed. Furthermore, it is estimated that Satoshi currently holds the largest amount of bitcoins, and stands to become possibly the richest person in the world upon its success. There is no way he or she would have allowed for any sort of loophole, even in the original code, to compromise this. Therefore, it is extremely unlikely that these mediocre scammers have discovered some sort of vulnerability to exploit in the popular digital currency. Review Verdict: Bitcoin Loophole is a scam! We hope that this Bitcoin Loophole review has enlightened you to the many shameful tricks and schemes utilized by scammers, which can be seen in this fake investment service. This so-called trading software serves no purpose other than to pilfer from opportunists looking to profit from the latest Cryptocurrency investment trend. Share your feedback below this review or any questions if you have any experiences or questions related to this questionable software. It is a scam. I have opened an account with 250 dollars. I did make a small profit of 8.00 dollars only because the trader closed the position after 10 min. Then he was pushing me to invest 5,000 dollars and because I did not want to, he was offering half the money to me. I still refused and never heard from him again. I chased and his manager took my case and gave me a lesson about how I had a poor people mentality. Before he called me he opened a position without asking me and then he showed me on my account that now I had made 352 dollars profit and then him as well was asking me to invest 5,000 dollars which I refused. He offered to give me money and he said the profit and the money he gave me will be mine and I would not have to pay back because he will have made a big commission. When I said ok let’s try, he asked me to give money because he was no charity and told me he had wrongly explained. I refused again and he started being aggressive, telling me how he has been wasting his time talking to me for one hour and that I will always be a poor person. I asked for my 250 dollars plus profit transferred back to my account and suddenly the money shown on my account disappeared. I emailed them and a third person called me to say that I made a second position and I had lost all the money. This person was rude and I hanged up. It is a total scam and they are cowboys. Basically if you give your money they would trade your money without asking you, they play up with the account and they do lie. I also told them they ads were untrue and he never gave me a reply about that.